Now that you’ve enjoyed my Brazilian nut cream recipe, I would like to sort of share a sequel with you. Fettuccine Alfredo is one of my favorite pasta dishes. They are one of the most ordered dishes in the menu at any Italian restaurant I dine at. I suppose it would be fair enough for me to proclaim myself as a fettuccine Alfredo connoisseur. Hubby and I would practically scrape the pan clean whenever I would try to replicate my own fettuccine Alfredo from home. Alfredo sauce consists of Parmesan cheese and a heaping amount of butter. That unto itself sounds like artery-clogging heaven. I guess a seldom helping of this very dairy and creamy dish isn’t going to provoke a heart attack. 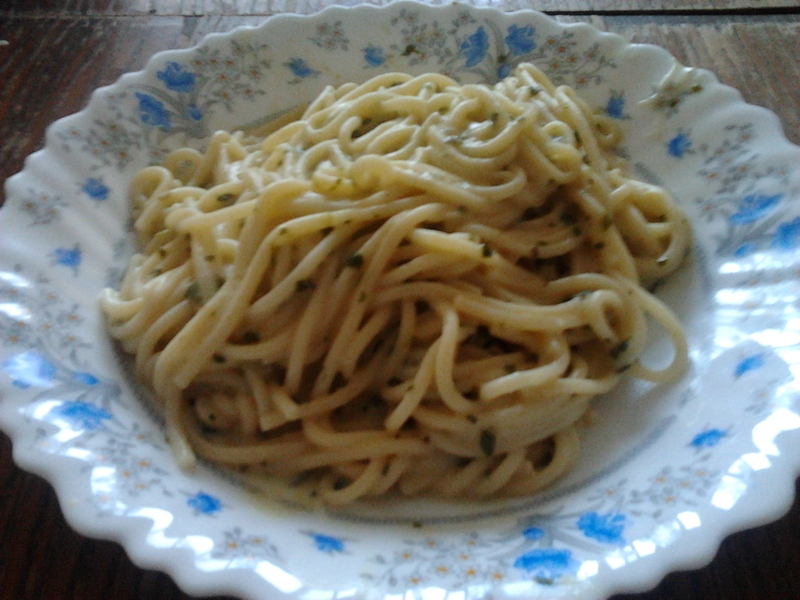 I simply recreated a vegan Alfredo sauce recipe that is suitable for the health conscious (I tried anyhow). I used some of the nut cream, and a bit of mustard along with some ground pepper and fresh herbs. If you prefer to use coconut milk instead, do so by all means. Either way, you can expect a velvety luscious and flavorful sauce. The picture features spaghetti instead of fettuccine. I used spaghetti because I needed something on the go and that’s all I had at that time. Use fettuccine or linguine if you have some on hand. Spaghetti sufficed it for me. Regrettably, I did not add vegetables to this pasta dish but the ideas are still available. You can use mushrooms, spinach, or broccoli. Cook and drain fettuccine noodles according to package instructions. Reserve a 1/2 cup of pasta water before draining and set aside. Return drained noodles to a pot or large skillet and set aside away from the stove. In a blender, combine remaining ingredients and blend until very smooth. Pour blender contents over fettuccine noodles in the pot or skillet and place on medium heat. Add in vegetables if you desire and cook until heated through. Serve hot with a bit of fresh herbs. This entry was posted in Vegetarian and tagged fettuccine Alfredo, nut cream recipe, pasta dishes, vegan Alfredo sauce recipe, vegan dinner ideas. I recently bought Brazilian nuts out of morbid curiosity. After doing so, I am disappointing that I have not discovered them any sooner. I am a huge nut addict. If you put a bowl full of assorted nuts, they will be devoured within seconds. I pity those with nut allergies, especially poor hubby. Not only are they full of nutrients, but they help curb my cravings for sweets and mega-salty snacks. As I reiterated before, Brazilian nuts are my recent discovery. These nuts are the seeds of a large tree that grows up to 50 meters (160 feet) tall in the Amazon jungle. Brazilian nuts have an unusually tender, rich and mild flavor. Their shells are notoriously difficult to crack. Brazil nuts are often used in baking and go well with chocolate, cookies, or any other dessert/snack. The oil made from Brazil nuts has a pleasant nutty flavor and can be used as a high-quality salad oil. Brazilian nuts can be eaten raw or used in cooking. As whole nuts, they are used in confectionery and are good for decorating fruit cakes or larger cakes because of their nice shape and size. When roughly grounded, they make good toppings for desserts and add crunch to rice or vegetable dishes. Ground Brazil nuts can be stirred into cakes and cheesecake bases. They can also be used to make nut spreads (a light bulb just lit up in my head) and creams as you will momentarily learn how. 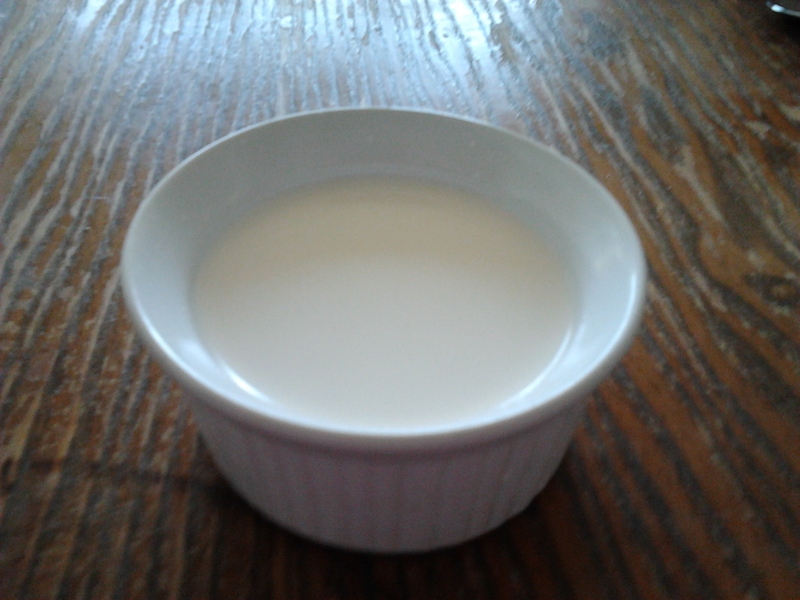 Until now, I have been using non-dairy store-bought creamers for soups, desserts, and drinks. I have been on a quest to search for healthier and soy-free alternatives as cream is generally laden with fat, high sugar content, and chemicals. The idea of making cream from nuts is not too farfetched as one may think. As a matter of fact, I think it’s a brilliant idea. You can take pretty much any raw nut and make it into a cream, but there are a couple that work for this purpose extra well. Cashews and macadamia nuts are both excellent choices. However, I used Brazilian nuts for this soy-free cream recipe. Brazilian nuts have a rich and buttery flavor which offset this nut cream. Akin to most recipes using raw nuts, Brazilian nuts need to be soaked for a couple hours till overnight. You can make this Brazilian nut cream recipe sweet or savory. I prefer to keep the flavors as neutral and natural as possible. I used this Brazilian nut cream for a spaghetti Alfredo recipe in which I will be sharing in my next post. Soak the Brazilian nuts overnight. Drain them and add them to a food processor. Pulse a few times to grind them up. With the motor still running, drizzle in 1 cup of fresh water, stopping a few times to scrape the bowl of the food processor down. You can continue to add more water depending on how thick or thin you’d like the cream to be; you may want it as thick as whipped cream, or you may want it to be closer to the texture of coconut milk. Keep adding water until you like the consistency. Alternately, you can add the nuts and the water to a high speed blender and blend, adding water as needed, till you reach the desired consistency. For a savory cream, add the lemon and sea salt. For a sweet cream, add the maple syrup, cane juice, or sugar. For an extra smooth cream, pass the mixture through a sieve lined with cheesecloth. This entry was posted in Gluten Free, Sauce, Vegetarian and tagged Brazilian nut recipes, Brazilian nuts, nut cream, soy-free cream recipe. Before watching Hell’s Kitchen, I had no idea what a Beef Wellington was. Now I can’t help but associate a beef Wellington or any kind of Wellington for that matter, with the images of Gordon Ramsey yelling at his chefs for sending up undercooked or overcooked Wellingtons to the pass. I wonder what his opinion would be of my Salmon Wellington or should I not dare ask? Beef Wellington is a traditional English meat dish made of beef fillet coated with finely chopped mushrooms, herbs, ground beef and fat. which is then wrapped in puff pastry and baked. While there are many variations, Beef Wellington is the most popular one. For this recipe, however, I used fish. Salmon, or any fish for that matter, is a great alternative to beef. This Salmon Wellington recipe consists of salmon fillets, sun dried tomato herb filling, smoked mackerel pate, and puff pastry (you can use phyllo dough for a reduced fat version). You can even mix in cheese to the sun dried tomato herb filling if you want to. This Salmon Wellington recipe makes a sumptuous meal with new potatoes and salad. Preheat oven to 425 degrees F (220 degrees C). Set salmon fillets aside. Place sun dried tomatoes, garlic, herbs, and olive oil in a food processor. Process those ingredients till a paste-like consistency forms. Season with salt and pepper. In a medium bowl, blend the pate and cream. Mix in the sun dried herb filling. On a lightly floured surface, roll out the pastry to make 12×14 inch rectangle. Place 1 slice of the salmon fillet in the center of the rectangle. Spread with 1/2 the pate mixture and layer with the other piece of fillet. Spread remaining pate mixture on top. Fold pastry edges over the filling towards the center, and seal with egg. Brush pastry on all sides with egg. Bake 25 minutes in the preheated oven, or until golden brown. Serve warm. This entry was posted in Dairy, Fish and tagged Fish Wellington, Pastry dough, Salmon, Salmon Wellington recipe, sun dried tomato herb filling. I’ve been hooked on to making ice cream as of late. I feel that the brutal summer heat motivates me to do so. Even though I wish I had an ice cream maker, I have been getting by very well with my blender. I even froze the bowl for a couple of hours and it seemed to function just as well as an ice cream maker. I suppose the advantage of not having these appliances at my disposable leaves room for imagination and ingenuity. And it all paid off very nicely. As I was saying before, I am a sucker for ice cream. If you buy a tub of ice cream, you pretty much have me in a headlock. One spoonful eventually leads to licking the entire container clean. In actuality, I have more self-control than that. But I am sometimes guilty of having more than my share. Ice cream usually consists of excess amounts of eggs, heavy cream, sugar, and a variety of flavors. I decided to trim it down with my ice cream recipe. My ice cream recipe contains none of these caloric, artery clogging, and mega-fattening ingredients. This is an egg-free non-dairy ice cream with a heavy impact of flavor and creaminess without the guilt factor. 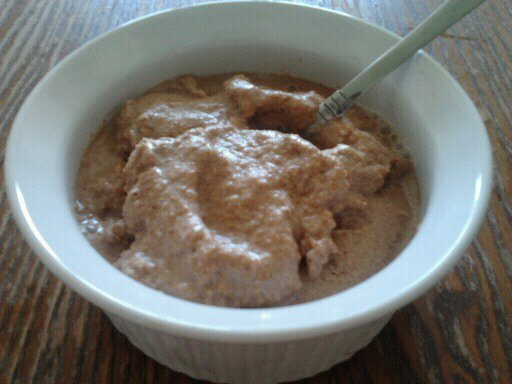 I made almond milk a couple days ago before making this mocha almond ice cream. I’ve sent the almond residue aside and incorporated it into my ice cream along with ripe bananas, a cup of dissolved coffee and cocoa powder, touch of vanilla, and agave nectar. Yes, this ice cream recipe is sugar-free as well. I chose the mocha flavor because it is one of my favorite flavors. If you don’t like mocha, you can exclusively use coffee or chocolate. Or you can use fruit. If you can’t finish your ice cream, reserve leftovers for making milk shakes. I promised hubby that I would make him mint chocolate ice cream or frozen yogurt soon since he can’t eat nuts yet. I will hopefully be sharing that recipe with y’all soon once I have his approval. Place nuts in a container or in a bowl. Fill it up with water, cover, and allow it to soak for 4-8 hours. Drain, and pat dry very well with a paper towel. Combine all ingredients in a blender, and blend until all the nut bits have disappeared and mixture is completely smooth. Scoop out into individual bowls, using an ice-cream scoop for authentic presentation. Eat immediately, or freeze each bowl up to an hour for the perfect ice-cream consistency and texture. This entry was posted in Desserts, Gluten Free, Vegetarian and tagged egg-free, ice cream recipe, non-dairy ice cream, vegan ice cream recipe. Rosh Hashana marks the Jewish New Year which falls out in two weeks. Thankfully, I am covered for most of the meals. On Rosh Hashana, we eat foods that symbolize good things we hope for in the coming year. Apples and honey hint of a sweet year, while fish hints at a prosperous year to come. Apples and pomegranates are some the many symbolic fruits that are featured in this fruit salad recipe. That is why I dubbed it as New Years Fruit Salad. The title is predictable but the flavors have a surprise factor. I purposely selected these ingredients as they give this fruit salad recipe a semblance of festivities. Sometimes, an Asian pear would be presented at our table. Our family tradition was to present and serve fruit that we normally don’t eat on a regular basis. An Asian pear, or a pyrus pyrifolia, is a cross-between an apple and a pear. This species of Asian pear is a pear tree species native to China, Japan, and Korea. Also known as apple pears, Asian pears are low-calorie fruit that are high in fiber and vitamins. This fruit’s skin is thin enough for eating the fruit raw like an apple, without peeling, but easily removed with a sharp paring knife to reveal creamy white flesh. You can also add in star fruit, dates, or walnuts if you prefer. 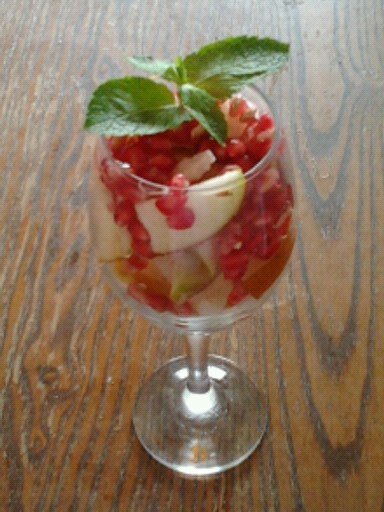 I have included a lemon honey dressing for this fruit salad. A bit of ginger adds a nice touch as well. After all, given all that much of the time during the Jewish New Year holiday is spent either sitting in synagogue praying or sitting around the dining room table eating, it is a good idea to include salads on the Rosh Hashanah menu. Place all the ingredients in a salad bowl and toss. If not serving immediately, securely cover salad with plastic wrap so the fruit won’t oxidize. This entry was posted in Desserts, Gluten Free, Vegetarian and tagged Asian pears, fruit salad, fruit salad recipes, Jewish New Year, Rosh Hashana, symbolic fruits. The value of Mediterranean-style eating has been born out by years of research. Numerous studies have shown that the lifestyle and dietary habits of Mediterranean regional nationalities contribute to long life expectancy and low rates of heart disease, cancer, and other chronic disease. Because Mediterranean cuisine encompasses a number of nations, climates, and topographies, it is not always that simple to define it in a nutshell. Some of the regions whose cuisine is considered Mediterranean are Italy, Greece, Spain, Israel, Lebanon, Morocco, and coastal Egypt and France. Some of the common denominators that these national cuisines have is their affinity for olive oil, olives (not a fan and not featured in this recipe), and, onions eggplant. The Mediterranean diet is largely plant-based, filled with a profusion of vitamin- and antioxidant-rich fresh fruits and vegetables, high-fiber grains and legumes, and complex carbohydrate-rich pastas and breads. Garlic is used generously in nearly every region. And every cuisine generally utilizes generous amounts of herbs and spices to play up its unique character—from Morocco’s sweet mixes of cinnamon, ginger, and turmeric to Italy’s aromatic herbs—basil, marjoram, oregano, rosemary, and more. If you are looking for easy vegan ideas that are nourishing and filling, this Mediterranean stew recipe is the perfect solution. You can throw in some pine nuts or cashews. Serve this stew over a bed of whole wheat couscous. Place all ingredients in a pot. Fill it up with 4 cups of water or vegetable broth. Allow it to simmer for an 1 and a half. Discard bay leaf. Follow cooking instructions for couscous. Serve stew over couscous. Garnish with a fresh parsley leaf (optional). 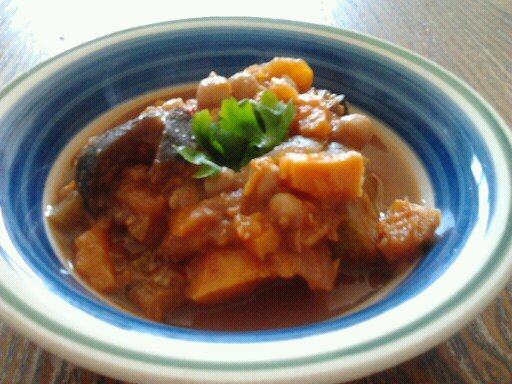 This entry was posted in Gluten Free, Vegetarian and tagged Mediterranean diet, Mediterranean Vegetarian Stew, vegan dinner ideas, vegetarian stew recipes. Even though using canned corn and chickpeas saves time and energy, using fresh ingredients is more healthful and natural. I’ve never been a fan of cooking chickpeas. Although cooking fresh corn takes minutes, cooking with fresh chickpeas entails overnight soaking. Why should it take you 24 hours to make a salad? Who has the time and patience for that? I personally feel it’s worth the wait, especially if you are preparing a salad for a social event or a big meal. If you made a bean salad before (not using canned beans), you should have a good idea what it entails. If you are still insistent on using shortcuts, I recommend that you use frozen chickpeas as it doesn’t contain as much sodium as canned chickpeas. If you already have cooked chickpeas and corn at your disposal, then all you have to do is toss them together with the peppers, onions, and vinaigrette. As a regular salad eater, I was looking for something different than my usual cut-up vegetables as lettuce routine. Chickpea corn salad was a novelty to me. This Mediterranean salad recipe features fresh sweet corn, crisp red bell peppers and buttery-textured chickpeas in honey-citrus vinaigrette scented with cumin. It’s a crowd pleaser, perfect for a backyard cook-out or picnic. Consider making extra. Don’t be caught with your pants down for not making enough. I’ve been in that predicament one too many times. The leftovers are delicious for lunch as many leftovers tend to be. I used lemon juice for my citrus vinaigrette but lime and orange juice would be fine too. This fresh and colorful chickpea corn salad is full of bright flavors and textures. Sweet corn pairs beautifully with creamy chickpeas and crisp peppers held together with tangy honey-citrus vinaigrette. Combine all ingredients in a large bowl and toss well. Cover with plastic wrap and refrigerate until ready to serve. 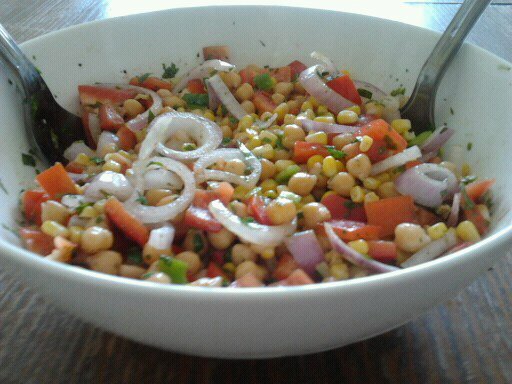 This entry was posted in Gluten Free, Salad, Vegetarian and tagged chickpea corn salad, Citrus Vinaigrette, cooking chickpeas, fresh corn, mediterranean salad recipe.